They have more cutting edges and will remove material faster. Double cut are sometimes referrred to as Cross Cut (2 flutes cut across each other) will leave a smoother finish than single cut due to producing smaller chips as they cut away the material. 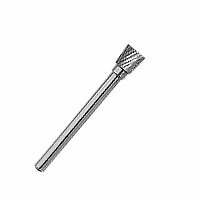 Carbide bur with standard flutes are used for easy material removal and leave a smooth finish. These burs are ideal for use on hard wood and most metals including stainless steel, steel alloys, cast iron, etc., 1/8″ shank, 35,000 RPM Max Speed. Made in USA. Tree radius with 1/4″ head dia., 1/2″ head length, 2-1/32″ overall length. Tree point with 1/4″ head dia., 1/2″ head length, 2-1/32″ overall length.